Between Michael Brown, Eric Gardner, Kelly Thomas, if you’re getting a little tired of hearing about law enforcement officers causing serious pain and ultimate death to citizens without facing harsh consequences, the officer in the video below, shown gunning down Walter Scott in North Charleston, South Carolina, will not be another added to that long, long list. 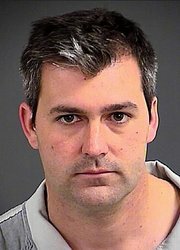 Officer Michael T. Slager has been arrested for murder relating to the death of Walter Scott. Varying allegations on whether or not Scott had an arrest warrant for child support enforcement have been swirling; however, the evidence in the video is pretty clear: 8 shots fired at an unarmed man, and then the Officer tries to plant a taser on the victim to make it appear justified. Keep in mind, he is only arrested. He will still have to be indicted, and as I’ve previously indicated, that is a tough measure to accomplish if he gets to testify at the grand jury hearing. Follow me at @DavidTDorer, listen to the David Dorer Show live every Friday (Available on iTunes and on Stitcher). Also, make sure to check out Talking Law with David Dorer every Wednesday. (Available on iTunes and on Stitcher).